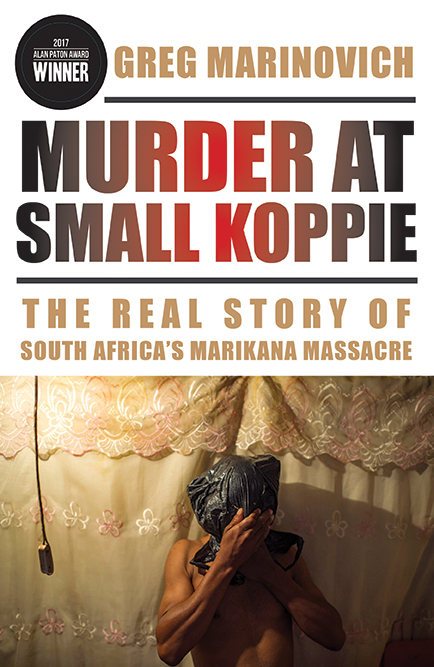 An award-winning investigation that has been called the most important piece of journalism in post-apartheid South Africa, Murder at Small Koppie delves into the truth behind the massacre that killed thirty-four platinum miners and wounded seventy-eight more in August of 2012 at the Marikana platinum mine in South Africa’s North West province. News footage of the event caused global outrage; however, it captured only a dozen or so of the dead. Here, Pulitzer Prize–winner Greg Marinovich focuses on the violence that took place at Small Koppie, a collection of boulders where a second massacre took place off-camera and in cold blood. Combining his own meticulous research, eyewitness accounts, and the findings of the Marikana Commission of Inquiry, Marinovich has crafted a vivid account of the tragedy and the events leading up to it. By taking readers into the mines, the shacks where the miners live, and the boardroom, Marinovich puts names, faces, and stories to Marikana’s victims and perpetrators. He addresses the big questions that any nation must ask when justice and equality are subverted by conflicts around class, race, money, and power, as well as the subsequent denial and finger-pointing that characterized the response of the mine owner, police, and government. This is a story that is both stirring and accurate. Greg Marinovich is a Pulitzer Prize–winning photojournalist, author, and filmmaker. He was a Nieman Fellow at Harvard University and teaches Visual Journalism at Boston University and Harvard University.